If you have a smartphone and a United Airlines frequent flyer account, you don’t want to miss out on this simple way to earn United miles. The app, which is available in both the Apple App Store and Google Play, allows you to earn miles for every dollar you spend at a variety of restaurants and retailers. The exact amount of miles per dollar earned depends on the specific merchant and if any specials are being offered at the time. 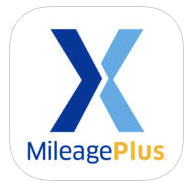 First, you need to download the MileagePlus X app to your smartphone. Once downloaded, you’ll log in using your United MileagePlus account number and password. This automatically connects your frequent flyer account to the app, allowing purchases and the accompanying earned miles to be credited correctly. 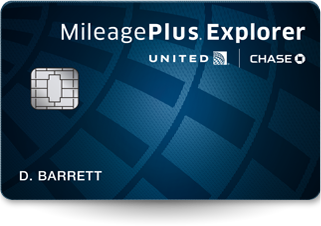 If you’re a holder of the Chase United MileagePlus credit card, you’ll automatically earn a 25% bonus on all purchases made via the MileagePlus X app, whether you use that credit card to pay or not. After you’ve connected the app to your United frequent flyer account, you’ll need to add a credit card – or a few – to the app for future purchases. When it’s time to make a purchase, you can select whichever credit card you want from those you’ve entered – which is nice when certain cards are offering their own category bonuses. 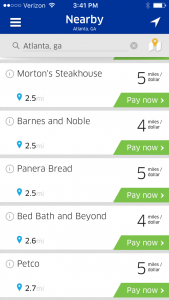 An example of this would be using the Chase Freedom card when it’s offering 5x earning on dining purchases to make your Panera Bread purchase on the MileagePlus X app. 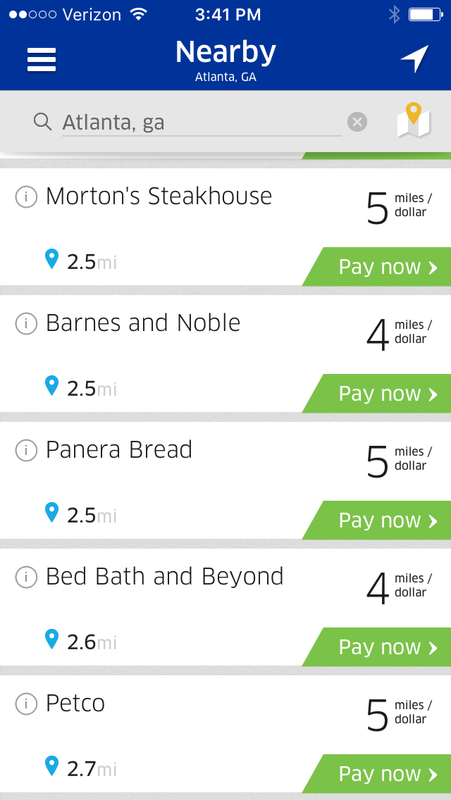 You’ll earn 5 Ultimate Rewards points per dollar via the Freedom card and 4 United MileagePlus miles via the MileagePlus X app for the Panera Bread purchase for a total of 9 points/miles per dollar spent. Not a bad deal at all. 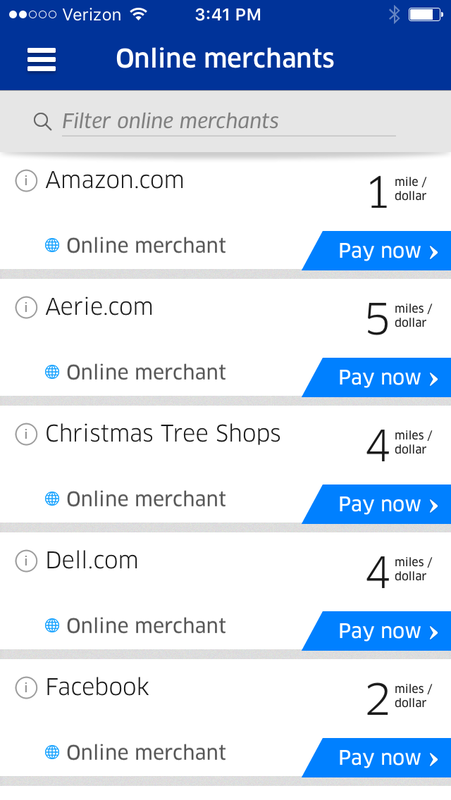 When you open the MileagePlus X app on your phone, it automatically loads a listing of nearby participating merchants along with the miles per dollar amounts each is offering. Simply select the merchant at which you’re planning to shop and make your purchase by inputting the dollar amount and selecting the Pay Now button. 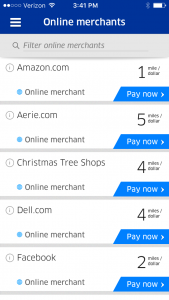 You are purchasing an online gift card to the merchant you selected. You can either purchase a pre-determined amount prior to going to the store, or you can have the app open to input the specific dollar amount of your purchase. One caution, the purchase isn’t always instantaneous. Sometimes it requests your password even though you’re already logged in, requiring the extra time it takes to input that info as well as a brief period to actually complete the purchase. Rarely has it been more than 30 seconds for all of that, but if there’s a long line waiting behind you, just know you’ll likely be getting some curious stares as you stand there, seemingly doing nothing but gazing at your phone, as you wait for the transaction to complete. That’s why I usually buy the gift card in a set amount prior to heading to the store. If there’s an amount left on the e-gift card, I can use it at a later date, and if it’s too little, I’ll pay the difference with a credit card. The actual in-store purchase is simple, I open the gift card within the MileagePlus X app on my smartphone, hold it up to the cashier who uses a handheld scanner to scan the gift card. A very easy process when dealing with registers that use scanners. While you can purchase e-gift cards to a sit-down restaurant, I’ve been reluctant to go this route. Unless the restaurant has a scanner they can bring to the table – something I’ve never seen – you’ll either have to let the server take your smartphone or copy down the gift card number for him/her to input into the restaurant’s system. Either way, it’s not going to be a simple, or preferable, payment option for you or the server. If you do go this route, consider tipping accordingly. But for purchases at Petco, Panera Bread, Sears, etc., the checkout process is as easy as holding up your phone and getting the e-gift card’s bar code scanned. And if you’re out of town and want to see what participating merchants are nearby, simply input a city name and up loads merchants in that area. There is also an Online Merchants category from which you can purchase e-gift cards for use at online retailers. I usually purchase my dog’s food at Petco, using the MileagePlus X app to purchase a Petco gift card. I buy the gift card prior to entering the store, inputting an amount just less than the typical purchase price. I’ll then pay the remaining balance – usually less than a dollar – using cash or credit card. Petco, on the MileagePlus X app, earns 5 miles per dollar, so I earn roughly 200 United miles for each bag of dog food I buy. And I can either buy the food in-store using the app, or online, by inputting the e-gift card number at checkout. The miles earned are automatically deposited into my United account. While not a problem for dog food or similar purchases, it is important to remember gift cards are being used to buy merchandise. Which means, if you might need purchase protection which is provided by many credit cards – say for a TV or cell phone purchase – you probably do not want to use the MileagePlus X app. I’ve found the MileagePlus X app a great addition to my mileage earning options. Obviously, credit cards and their bonus spending categories lead the way; but using the app, especially when no bonus categories are applicable, is a great way to increase your United MileagePlus balance. 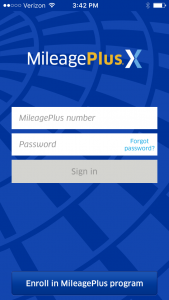 Do you use the MileagePlus X app?